The road to Studio Barcelona has been a long and winding one. After working in corporate America for over 20 years in client services and project management, Lynita joined fellow artist Jessie Schroeder Voss at her studio and shop, My Table Gallery in Muskego. 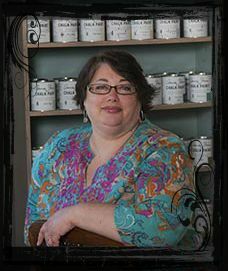 They became the first Chalk Paint® stockists in Wisconsin in the fall of 2011, quickly outgrew the 400 square feet shop in Muskego and moved My Table Gallery to Hales Corners a year later. Jessie turned over the shop to Lynita in 2013 so that she could spend more time with her family and concentrate on her successful pottery business. Following a desire to open a business in her Washington Heights neighborhood, Lynita opened Barcelona in the fall of 2013. Why the name Barcelona? “I find the city of Barcelona creatively inspiring and I wanted people to be creatively inspired when they came into my shop”. Once the decision was made to close My Table Gallery and realizing that Barcelona wasn’t big enough for all of her plans, Lynita went in search of a new space. Fortunately a space on the next block opened up and became the location for Studio Barcelona. We're excited to bring you a new space dedicated to Chalk Paint and to learning new skills. From expanding your Chalk Paint experience or learning how to create with watercolors, linoleum block printing, knitting and more. Join us as we start the next leg of our journey.